While working on the yard I noticed an interesting 'lady bug' species on our Chilean Mesquite tree. This species, called the Twice-Stabbed Lady Bird Beetle (or simply Lady Beetle...the "bird" part always seemed odd to me) was actually fairly prevalent on the tree, though hard to photograph because it never stayed still. There are three species of 'Twice-stabbed Lady Beetles', including Chilocoris Stigma, Chilocoris Cacti, and Olla v-nigrum. 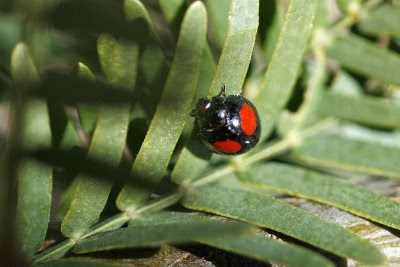 Compared to the well-known Lady Beetle species, these are quite a bit smaller, and apparently often go unnoticed. 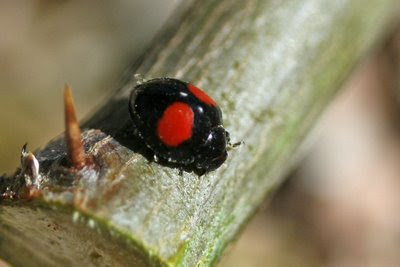 These 'Lady Bugs' like to eat scale insects and also aphids, mites, and caterpillar eggs. I'm not sure exactly what on the Chilean Mesquite they were attracted to. In any event, this is at least the third species of lady beetles I've seen in the yard, and I can't say I've ever exactly been looking for them. This is cool. I just found this same exact lady bug on our artichoke plant, probably to eat the aphids. I had to do a quick Google search to figure out what it was. I love having a garden. I learn something new every day.